This brought hope that it might be the end of animal testing in China, and I’ve received many questions about this news. Is post-market animal testing now banned in China? 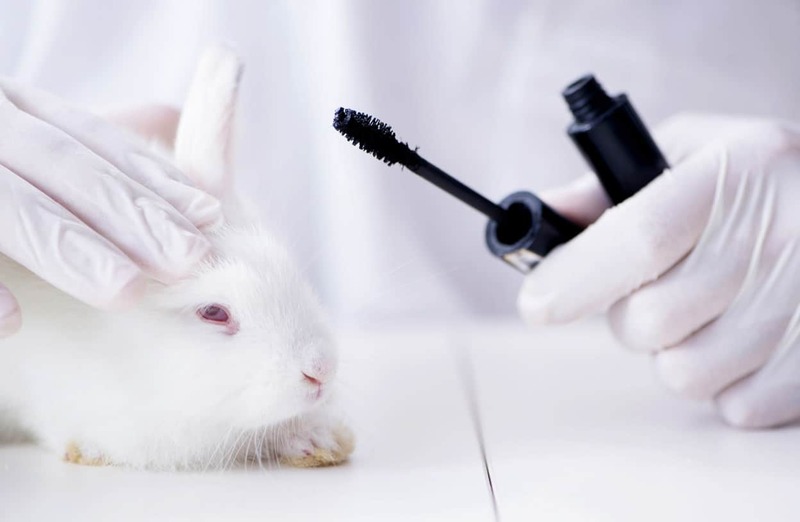 Does this mean the end of animal testing for cosmetics? Post-market animal testing is standing in the way for some companies who sell in China to be cruelty-free. Meaning, there are companies who have manoeuvred their way around the pre-market animal testing law, but fail to fall under the “cruelty-free” criteria in our book because they’re still subject to post-market animal testing. 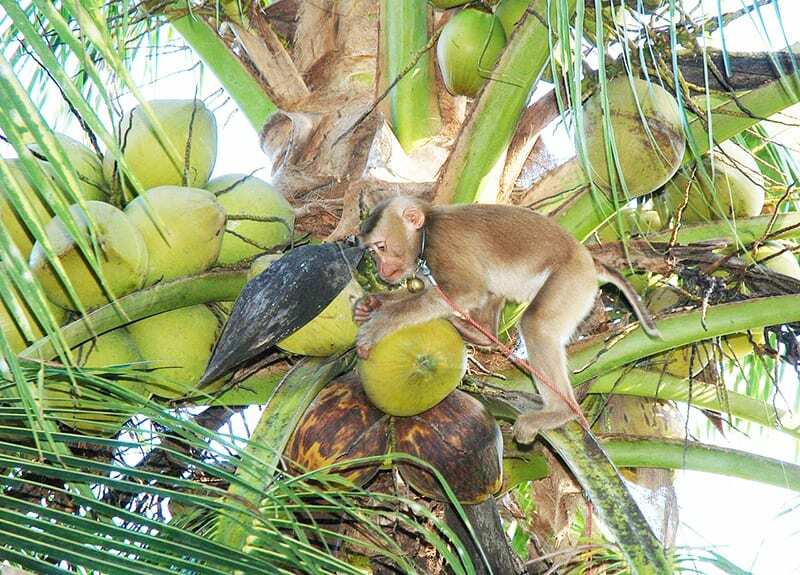 This means that their products can be pulled off the shelves and tested on animals. There have been headlines reporting this news as “China ending animal testing requirements on post-market cosmetics”, which is misleading. 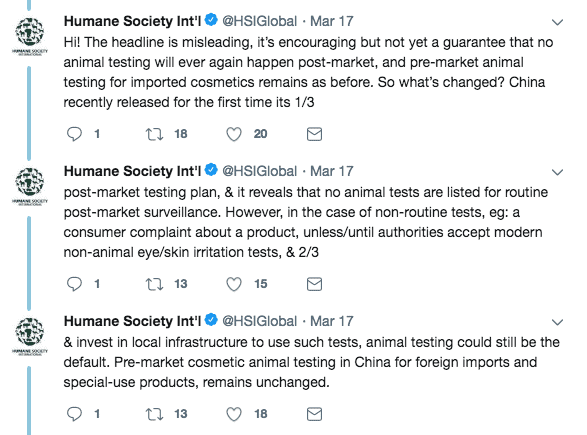 Humane Society International confirmed on Twitter that it’s unfortunately not the end of post-market animal testing in China. Basically, China has removed animal tests for routine post-market inspection. 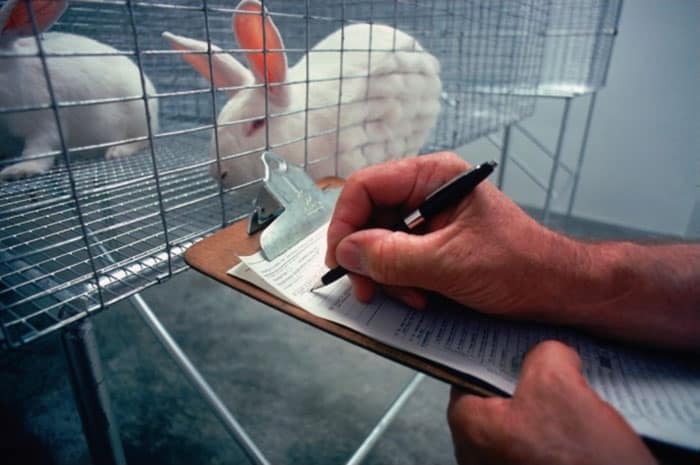 However, animal tests could still be performed in the case of non-routine post-market inspections, such as for a consumer complaint. Is this the end of post-market animal testing in China? Unfortunately not. However, this is a giant step in a positive direction. China has been slowly making progress in this department, like they’ve proven yet again this month, and we can see a bright future ahead. I don’t see why with all the products available to us that we need testing . If it has an adverse affect then don’t use it again . Humans should be used as the guinea pigs there happy enough to use the products after all . I just want to say how much I appreciate the update. It can be very difficult and time-consuming to do all the research, and I for one am very thankful to have people like you who do so much for the rest of us:) Thanks!!! Very disheartening in this day and age that widespread animal cruelty is so accepted in ANY country. Sadly, they have a terrible history of human cruelty as well so it’ll take hundreds of years for them to wake up about animals. Don’t hold your breath. 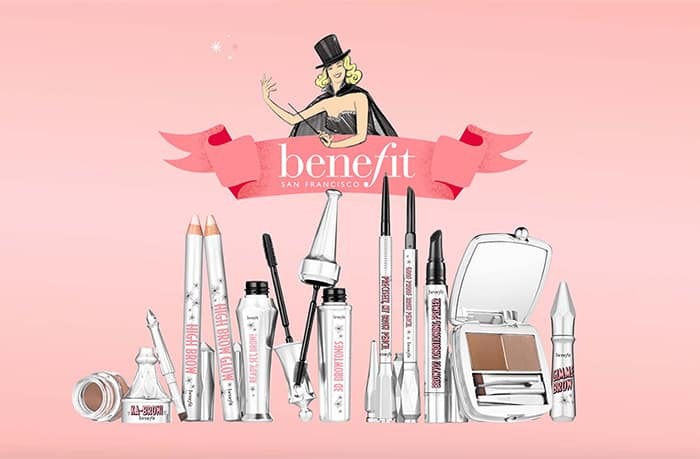 In the meantime, while it’s almost impossible to NOT buy items made in China we can ALL refuse to buy beauty products involving animal testing. Don’t always believe the headlines, no matter how much you want to as this has sadly proven. Thanks for the clarification and updates, as always! Just want to say thank you for being my source of information in this realm. I don’t have the know-how or always the time to stay up on the Developments, so I appreciate your page for educating me! Thank you for this update and really useful summary! It makes the situation a lot easier to understand. Hey cruelty free kitty! thanks for letting me know i’m appreciative but disappointed that china has not ended there intolerable policies love your stuff! saved me alotta time with my hair care products and such keep doing you! Thank you so much for this update. 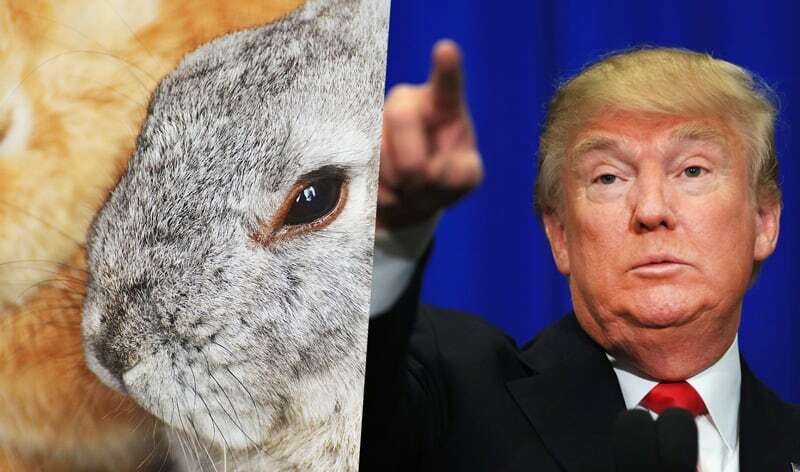 I look to you for the most reliable cruelty-free information, and wasn’t going to trust the mainstream media reports on this before seeing what you had to say on the matter. I 100% agree, Isabelle – this site is my go-to for news like this. Suzanna please could you help.me with a query ? I have been told that number 7 products by boots are cruelty free as they avoid animal testing in China by not having stores is this true? Thank you for pushing an email out about this! I was skeptical of the headlines, and appreciate getting a better explanation from a source I trust. Always a pleasure hearing from you Suzi, thank you for your continued hard work! Thanks for the update and the clarification, I am not surprised but hold on to the hope that they will eventually change! This is good news but unfortunately the beauty products are not so “cruelty free” at least not to the kids that mining for Mica. They use child labor and this makes me so sad.